With the new Boston outpost of Tender Greens, Brooke Spreckman of Design Hutch is hoping to break the mould. The Los Angeles-based designer is currently working to build prototypes for standard templating whilst giving herself the freedom to mix and match, creating bespoke aesthetics for each new restaurant. The Copley Square space, designed by Menemsha Architecture, is located in a sprawling mall that includes hotels, a station, and thoroughways frequented by students from nearby Northeastern University. Which might explain why Spreckman has been careful to inject light and colours into the space to draw in the passing traffic. 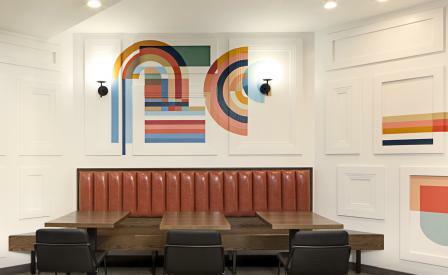 Unfurling along the walls like a boldly energetic Sol Lewitt homage are Mia Cross’s hand-painted murals of muscular geometric circles and stripes, whilst leather banquettes and light fixtures, by classic American brand Rejuvenation, add unexpected glamour.